Waterproof headphones haven’t been around for too long, but in today’s market more and more options are becoming available to the general public at an exponential rate. Some designs are made for swimmers while others are modified versions of elite workout headsets. Either way, this niche is getting more and more attention as more and more people want to listen to music or instructional material while underwater. If you’re looking to also enhance the quality of your underwater workouts or if you’re just looking to tune out the crowd even more, don’t settle. Get the best swimming headphones according to your needs and see the difference that they can make on your mindset. From simple earbuds to 2-in-1 underwater audio solutions, check out this list to find your perfect fit today. Should You Choose Dedicated Swimming Headphones? Waterproof headphones need to withstand a lot more than just a quick dip or heavy rainfall. If you want to take them swimming then you need them to handle complete submersion. These headphones from H2O Audio will let you spend a lot of time at up to 12 feet underwater without suffering a hit on sound clarity. However, diving under 12 feet is not advised. Spending too much time under the threshold may cause structural damage and may even void the warranty. What makes these headphones even better is that they are designed mostly for athletes. Therefore, they have a longer lifespan than other models on the market. It also means that they are comfortable without compromising fit or security. The ergonomic shape should fit all adults perfectly. Whether you’re doing water aerobics or underwater laps around the pool, no amount of friction can shake the earphones loose from your ears. While there is no color variety and no carry case included in the package, the low fluidic drag of the H2O Audio headphones and the decent sound quality under pressure makes them quite the water workout gadget. The Swimbuds Black creates a tight seal in the ear and also has a tight seal around the jack. The stereo jack is also gold plated to minimize corrosion and extend the life of the gadget. 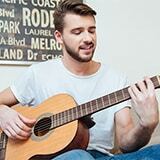 What’s particularly interesting about this product is that it comes with some extra perks. 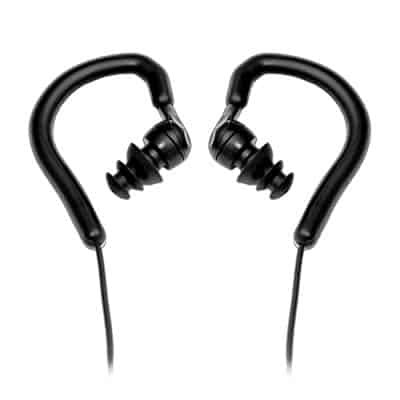 For one, it features four different earbud tips which should cover a wide range of users. 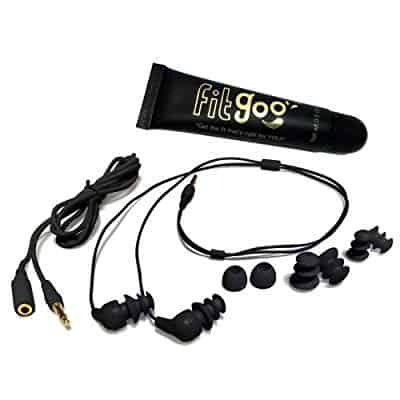 Secondly, there’s also an earbud lubricant in the package, the FitGoo lubricant, which should make the Swimbuds Black much easier to put on. The design and hardness of the earbuds also allow you to be quite active underwater. You should be able to do anything from flips, turns, and weight workouts to diving without worrying that they’ll shake loose. The cord is not too long, but there’s an extension cord included in the package. You get a lot of extra stuff alongside the waterproof Swimbuds Black. Considering the modest price tag these can be viewed as nice incentives. 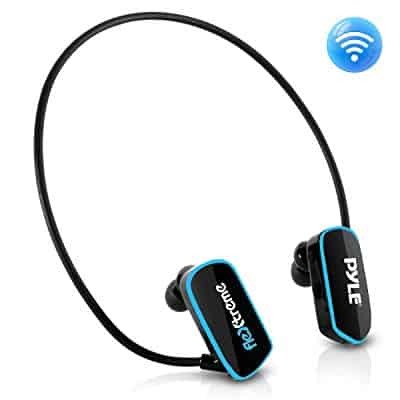 If you’re looking for a high waterproof rating above all else then you might just appreciate the Pyle PWPE10Bs earphones more than anything else. 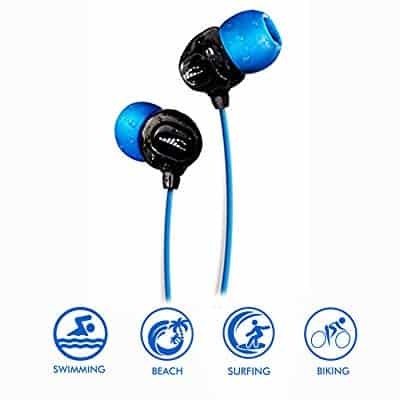 These earbuds are rated IPX7 waterproof, which means they can withstand all types of demanding physical activities underwater. The fit is not the greatest but you do get three interchangeable pairs of earbuds. The design is ergonomic, so once you find your perfect size you’re free to exercise underwater until you’re covered in wrinkles and beyond. The ultra slim design gives the PWPE10B a low fluidic drag which helps make the fit that much more secure. The quality of the drivers is also high-end. Unlike most waterproof headphones designed for swimming and diving that come with 8mm drivers, the PWPE10B has 10mm drivers and a 32 ohm impedance rating which gives them a consistent loudness and balanced sound. The cord has an adjustable length and it tops out at 4 feet. Although this may seem like a major bonus, keep in mind that adjustable cables aren’t the most durable. While they might not get damaged underwater they might succumb to wear and tear a lot faster just from folding them. With a wide frequency response range, a marine-grade waterproof rating, and multiple tips available, the comfort and sound clarity that the PWPE10B has to offer is impressive considering the modest pricing. Now, you don’t always need waterproof headphones to enjoy music in the water. The audio transmission of the Finis Duo MP3 player may just save you the hassle of trying to make your waterproof earbuds fit and remain inside your ears. This gadget has an IPX8 rating (waterproof up to 9.8 feet). Going over 9.8 feet might mess with the audio quality considerably though it won’t necessarily damage the Finis. The player comes with 4GB of storage space which should be enough to hold up to 60 hours of your favorite tunes. It also features a clip design which allows the device to rest securely on the cheekbones even while executing high drag maneuvers underwater. But, you may be wondering how it works without earbuds. Well, this player works off bone conduction audio transmission which means it doesn’t need a traditional output medium. As easy as this is to use and as comfortable as it is compared to stuffing your ears, don’t jump on it immediately. The price is not for everyone and the audio quality of bone conduction audio transmission is not premium quality just yet. 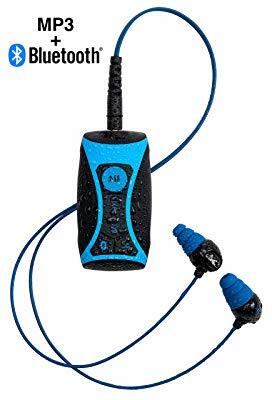 This MP3 player comes with standard H2O Audio waterproof earbuds. This means you get an IPX6 rating up to a depth of 12 feet for as long as you want. But exceeding the depth for more than 30 minutes might be enough to cause water damage. The sound quality is quite good even though the earbuds feature 8mm drivers. This is probably due to the use of neodymium magnets. However, what makes this product even sweeter is the MP3 player is Bluetooth capable. The wireless range tops out at 30 feet so if you’re at the pool, you’ll be able to connect to any aboveground device that’s in range. The downside is that the Bluetooth won’t work underwater. If you’re just looking for a swimming gadget, the H2O Audio MP3 player might be asking for more than its worth. However, if you want something that can handle underwater activities as well as aboveground workouts, you’ll be hitting two birds with one stone. And, just because the Bluetooth doesn’t work underwater doesn’t mean the player is useless. You still get 8GB of storage capacity so you can listen to your favorite playlist whenever you like. This HydroActive may have a short cable but the durability and level of customization are off the charts. Don’t get too excited though, as it comes at a premium price tag. If you’re a true workout enthusiast and more than a casual swimmer, you should appreciate the low fluidic drag and the superior security that the HydroActive provides. Anything goes, from aerobics to laps to diving, and you won’t have to give a second thought about the earbuds popping out of your ears. This is partly due to the wrap-around design. With that in mind, be aware that these earbuds won’t work with just any headgear. The sound quality is very nice. You should hear a balanced tonality and clear output across all frequencies. These earphones are great at vocals, airy in the high end, and accurate and punchy in the bass (within reason). The HydroActive earbuds also come with a carry case and multiple earbud. You’ll find that the tips come in various shapes too, not just different sizes, so some of them are almost certain to work well. The PSWP6BK is Pyle’s attempt to fix all your underwater audio problems with one solution. 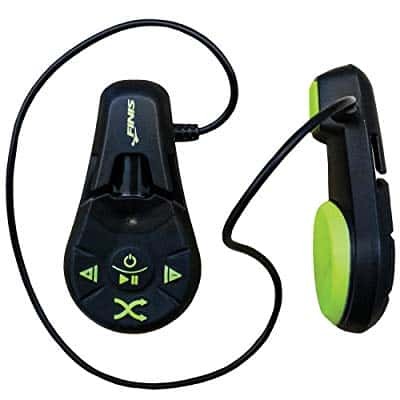 This package contains both an MP3 player and a pair of waterproof earbuds fitted on a wrap-around design that resembles a classic headphones set. The battery is built-in so you can quickly recharge your player with an USB cable. The storage capacity is 4GB which should give you more than enough for tens of hours of playback. The player and the earbuds are IPX8 rated for up to 9 feet. Granted, it’s not the best waterproof rating around, but you have to consider all the other features too. The sound quality is impressive and the battery life is up to 10 hours. The controls are touch-based and require simple drag and drop movements. Operating them underwater might take some getting used to, but you could always make a playlist before you hit the pool. The earbuds have a pretty tight fit that’ll take some breaking in. However, the wrap-around design doesn’t exactly promote a secure fit. You may want to stick to underwater swimming and avoid activities that promote high drag. 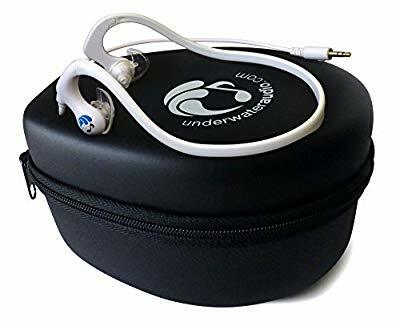 In a way it would make sense to buy a pair of waterproof headphones that are specifically designed for swimmers or divers. On the other hand, those can get quite expensive at times. There are plenty of reasonable options for all non-athletes looking to improve their lap times by listening to some workout playlists to get the adrenaline levels up. Another benefit of choosing hybrid headphones is that you’re guaranteed to get decent audio quality above and underwater. 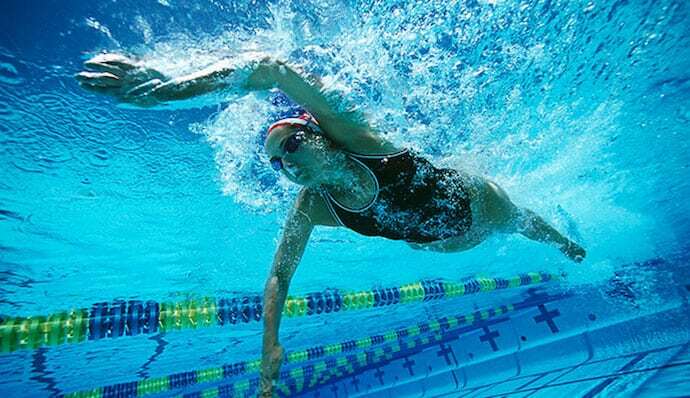 Sometimes dedicated swimming headphones may have a muffled sound above ground. There’s no right or wrong way to choose among these types of waterproof audio gadgets. However, each person has a specific set of requirements so it pays to know which option best suits you. Buying just earbuds means that you can pair them with whatever player you want. You will have to pay extra for MP3 player and earbud combos, but you get everything you need out of the box. The classic waterproof ratings are easily recognizable after the ‘IPX’ tag. Most waterproof earbuds come with IPX6, IPX7, and IPX8 waterproof ratings. You should always check the depth limit, too. For example, you may find a pair of earbuds with an IPX6 rating at up to 12 or 14 feet. It’s hard to say that those are a better solution for diving purposes than a pair with an IPX8 rating at 6 feet. While you can assume that the rating will drop if you go under 6 feet, it’s always harder to get IPX8 rated at any depth than IPX6 rated. It requires much better seals and tolerances. Putting your finger on a pair of headphones or earbuds and calling them the best headphones for swimming is no easy task. Although I have my favorites, I too switch products depending on the situation. Sometimes I prefer a loose fit if I’m not doing any strenuous physical activity. At the same time, the quality of your workout may depend on you having the tightest fit money can buy. Regardless of what you need, you should be able to single out the product that best suits you from this list.